No, someone else isn't playing Ratatat at work (anywhere), that's your phone ringing. But where is it? Under the napkins? Beneath that stack of TPS reports? Who knows. A problem with our ever-shrinking cellphones is that they're getting harder to find. 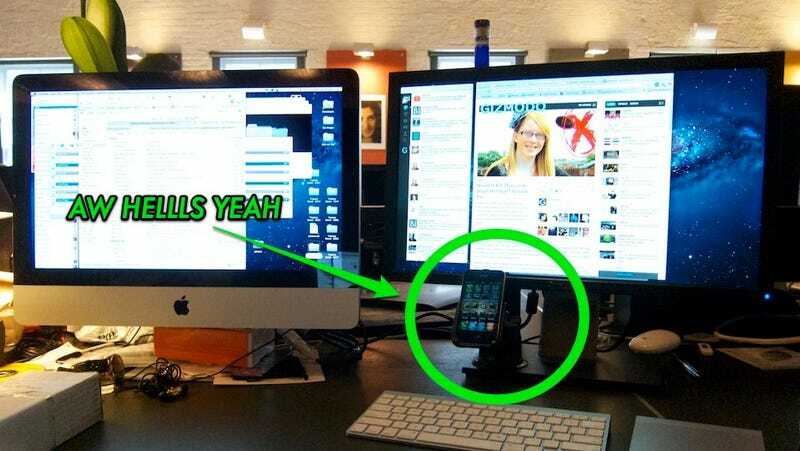 So how do you keep your cell in plain site while maintaining a properly messy desk? Get a car window mount, and suction-cup it to the base of your monitor. I use the RAM iPhone 4 Mount, which has the best sucker we've ever tested—a must when you're working with a less-than-smooth surface. I just rest my iPhone in it because my desk doesn't move enough for it to need to be so secure. Or at least, it better not.